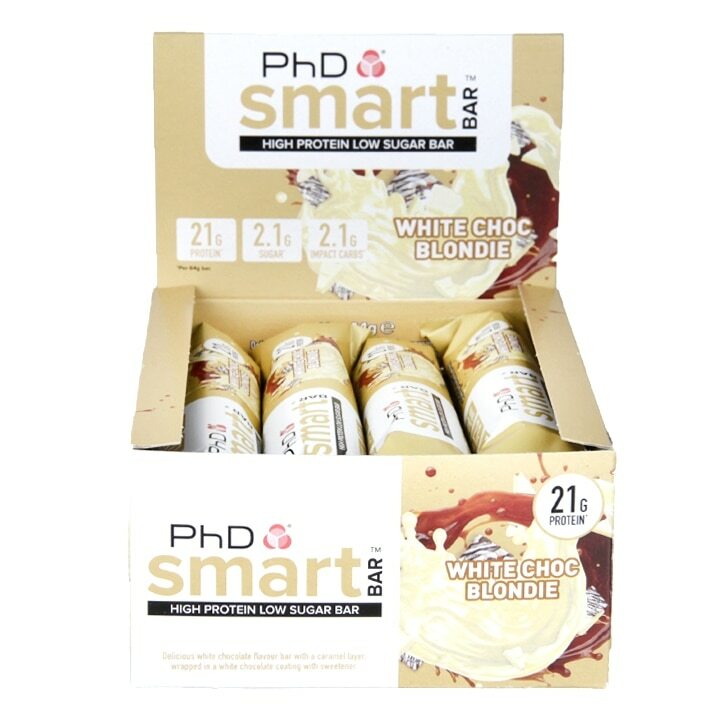 PhD Smart Bar is the intelligent way to get your daily protein fix without adding unwanted carbs. Protein Blend [Milk Protein, Collagen Hydrolysate, Soya Protein Isolate), Caramel [Sweetener (Maltitol), Condensed Milk, Cocoa Butter, Water, Colour (Titanium Oxide), Humectant (Sorbitol), Emulsifier (Sunflower Lecithin), Flavouring, Salt], Sweetener (Maltitol), Cocoa Butter, Cocoa Soya Crispies [Soya Protein Isolate, Tapioca Starch, Cocoa Powder], Whole Milk Powder, Humectant (Glycerol), Water, Coconut Oil, Natural Flavouring, Flavouring, Emulsifier (Sunflower Lecithin), Bulking Agent (Microcrystalline Cellulose), Natural Bourbon Vanilla Flavour. PhD Smart Bar White Chocolate Blondie is rated 4.9 out of 5 by 14. Rated 5 out of 5 by crushercrowley from Protein Bars Great product. Great taste. Value for money. Highly recommended. Rated 5 out of 5 by sika33 from great taste best low sugar snack ever !will get dome more soon.